Log in with your usual details to see your ResearcherID profile on Publons. 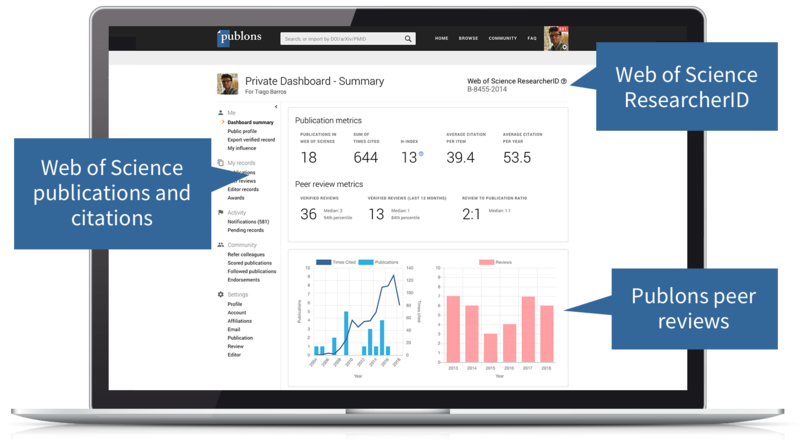 Publons is the new environment where you can benefit from the improved Web of Science ResearcherID, add your publications, track your citations, and manage your Web of Science record. Web of Science ResearcherID is now on Publons. If you have any questions, please see the ResearcherID-Publons FAQs or contact researcherid@publons.com. The Web of Science Group is investing in ResearcherID to make the experience of managing and evaluating researcher profiles more seamless, open, and connected for researchers, administrators, and evaluators. build a more complete profile of their research impact by automatically tracking their peer review and editorial history right alongside their publications. Web of Science ResearcherIDs are used by institutions and funders as a persistent identifier to track researcher outputs and to update publication records in Web of Science, ensuring correct author attribution and disambiguation. To make this even easier we are bringing the identifier closer to the Web of Science Group’s suite of products. Going forward, we’ll be using the Web of Science ResearcherID to keep publications synchronised across the Web of Science Group suite of solutions: Web of Science, InCites, Converis, Publons and more. A batch upload service, allowing administrators to submit publication data that will populate Publons profiles, update distinct Web of Science Author Records, and to assign Web of Science ResearcherIDs (and links to Publons profiles) to records across Web of Science collections. A researcher-centric API, allowing institutions to access rich information within researcher profiles for the purposes of populating internal systems. If you are interested in testing any of these services, email data@publons.com. Please note, all of these services are in the early phases of development and our approach may change as we learn more about what you need. If you were an existing user of the ResearcherID suite of admin tools and wish to continue using them, contact us at data@publons.com. Please include information about your existing account.